US airlines Southwest, Alaska and jetBlue are not escaping the stubborn pricing softness in the country’s domestic space which, as it does with the larger network US airlines, continues to pressure their unit revenues – unit revenue being a metric that, logically or illogically, has become a lightning rod for many US airline investors. Southwest is being hammered after sticking to its planned capacity growth for 2016 and sitting out on some of the fare increases undertaken by other airlines. Its unit revenues have been propped up by a credit card deal reached in 2015, but in 3Q2016 it will post a negative performance in that metric. Alaska is also feeling the effects of macroeconomic trends, but has expressed that its current situation is the result of real difficulty in determining when close-in bookings could improve – given the inherent shorter booking window for those reservations. Among those three airlines jetBlue posted the largest unit revenue declines for 2Q2016, but in fact it faces tough year-on-year comparisons due to its outperformance in 2015. The overall revenue choppiness continues to cast a pall over the US industry as predictions of when pricing traction will return remain opaque. In mid-2015 Southwest forged a new branded credit card agreement, which has helped to lift total unit revenues since that time. In 1Q2016 its total unit revenue (RASM) grew 0.1% year-on-year, and in 2Q2016 it notched up 0.6%. However, its yield and PRASM performance was negative, reflecting close-in pricing weakness in the US domestic market. In Jul-2016 Southwest marked the one year amendment date of the credit card deal and the benefits the agreement has contributed to its unit revenue will start to wane. For 3Q2016 the company is projecting a 3% to 4% decrease in unit revenue. The airline cited strong traffic and booking trends for 3Q2016, but also highlighted a challenging pricing environment, particularly in the booking of close-in fares. Southwest’s largest rivals, Delta and United, have expressed similar sentiments. Southwest executives have stated that revenue trends have been up and down throughout 2016, and softer fares are lingering in Jul-2016 and Aug-2016. Company CEO Gary Kelly remarked that trends in Sep-2016 look better than in the previous two months, but that scenario could change. He concluded that a lot of the airline’s competitors are offering “very hot” fares in Sep-2016, and, in his judgement, “we must match to get traffic. It is just that simple”. Southwest’s goal is to return to positive RASM by YE2016, but the company acknowledged that it could fall short of those targets. Unlike the three large global network airlines – American, Delta and United – Southwest has made no revisions to its plans to expand capacity 5% to 6% in 2016. The company has offered a few explanations for maintaining its planned ASM growth for 2016, despite the lingering pricing pressure. Mr Kelly has stated that the inventory published by Southwest is the schedule that the company intends to operate, and this is unlike the practices of its competitors, which mostly over-schedule and “claw back”. He has also said that Southwest is unable to model a scenario where cutting its schedule in 4Q2016 would be profit-positive. 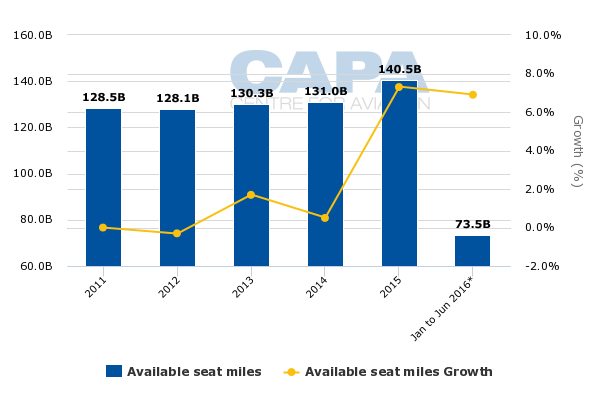 The airline has fielded numerous questions about its 2017 plans, but has not offered definitive guidance other than to highlight that its capacity peaked in 2015 and will drop in 2016; furthermore, it needs to be judicious about its growth for 2017. Investor preference appears to be weighted towards capacity growth in 2016 that is more in line with GDP. The airline has also drawn scrutiny for not participating in an industry-wide one-way fare increase of USD2-USD5 earlier in 2016. Southwest shies away from addressing direct pricing questions but Mr Kelly has stated that 2H2016 is proving to be more of a challenge, and the company needs to re-examine pricing, revenue, capacity and ancillary revenue to attempt to meet its financial targets. Southwest’s capacity decisions for 2017 will be watched closely as its overall unit revenue performance has turned negative. In order to feel comfortable that sustained pricing traction will return to the US market place, investors are grasping for solid indicators that the US airlines are committed to shoring up their performance in that metric. Alaska Air Group’s yields and PRASM each fell 7.7% year-on-year for 2Q2016. Sequentially, Alaska Airlines posted the same decrease in PRASM during 1Q2016, but the decline in yields worsened from 1Q2016 to 2Q2016 – from a 6.1% drop to the aforementioned decrease of 7.7%. The company grew its 2Q2016 capacity 11% year-on-year, and faced competitive capacity growth of 13%. Alaska has also highlighted pressure on the prices of close-in bookings and remarked that despite the pressure on fares, volumes remain strong. This is similar to the experience of other airlines. Offering some colour specific to Alaska’s business, company executives have made the observation that changes in the dynamics of close-in pricing in some West Coast markets began in Mar-2016 and progressed through 2Q2016. However, the company has observed that none of the downward pressure on pricing was unexpected. Its general conclusion is that conditions are not worsening, but it is tough to predict what could happen in the near future. Alaska took a broader view regarding the US pricing environment, joining the chorus that changes have occurred in fare fences and the revenue management of close-in bookings. Company EVP and chief commercial officer Andrew Harrison has said that those changes “are in some part a reaction to changes in dynamics of how people are flowing passengers across their network across the country. There’s certainly ULCC dynamics in here and there’s certainly new products being launched by some of the network airlines. And when you put all of that together, you’re getting what you’re getting today”. Mr Harrison has confirmed that Alaska is not immune to those dynamics; however, since the bulk of the pressure resides in close-in pricing, it is tough to determine when trends will turn positive. jetBlue Airways outpaced the industry in passenger unit revenue performance in 2015, but has not escaped the pricing pressure prevalent in the US industry throughout 2016. Its yields fell nearly 10% year-on-year in 2Q2016 and PRASM and RASM declined 10.5% and 8.2%, respectively. However, those comparisons are distorted in part to due to its positive performance in the year prior. jetBlue’s PRASM and yields in 20Q2015 increased 1.4% and 0.2%. The company listed familiar culprits driving its negative performance in yields and unit revenues; these included the tough year-on-year comparisons, industry capacity increases, and persistent softness in Colombia and Puerto Rico. jetBlue has previously outlined plans to cut capacity to Colombia by 25% in late 2016 and reallocate flying from its focus city in San Juan. Puerto Rico represents nearly 33% of jetBlue’s international seats, and the country has been mired in economic strife for more than a year. In Jul-2016 jetBlue executives explained that while San Juan remains profitable (albeit down from previous levels), weakness exists due to the territory’s economic challenges. 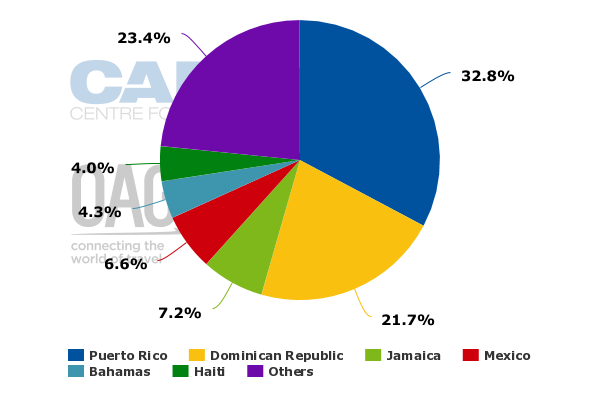 The airline now plans to cut its capacity to Puerto Rico by 5% after the US Labour day holiday. Overall, jetBlue plans to cut system ASMs post labour day by 2%. Those changes are reflected in previously announced plans to grow 2016 capacity by 8% to 9.5%, versus previous estimates of a 8.5% to 10.5% increase. jetBlue anticipates a RASM decline of 2.5% to 3% for Jul-2016, which the company stressed was the third sequential month of unit revenue improvement. It also forecasts meaningful sequential improvement between 2Q2016 and 3Q2016, but it is unclear whether the company will reach flat RASM growth by YE2016. Although its corporate share is increasing, jetBlue’s largest passenger segments remain in the leisure and VFR (visiting friends and relatives) categories, so Sep-2016 is a trough month. Similarly to the situation at American Airlines, jetBlue’s corporate revenues have fallen, but the decrease is less than that of the industry as a whole. The broad themes emerging from the six largest US airlines at the midpoint of 2016 is that the pricing of close-in bookings shows no signs of improving, despite strong volumes, and the most damaging effect of that scenario is continued pressure on unit revenues at a time when investors are searching for an inflection point. Previously, investors seemed to ignore the arguments that airlines made regarding record ROIC, strong profits and solid margin results. The new logic – that the benefits of fundamental shifts in pricing, revenue management and product segmentation will take time to materialise – will not appease investors' appetite for positive trends, and as a result, US airline stock valuations will continue to suffer.